The Group One contest centred around the Aidan O’Brien-trained Investec Oaks heroine Forever Together, who was the 4-6 favourite to follow up her Classic triumph at Epsom. O’Brien fielded three of the six runners in all and it was his Epsom third Bye Bye Baby who took the field along, with Forever Together second and the William Haggas-trained Urban Fox third under Danny Tudhope. It was clear rounding the home turn that Urban Fox was travelling much the best of that trio and, turning out just 11 days after finishing fourth in the Duke of Cambridge Stakes at Royal Ascot, the 9-1 shot powered up the straight to record a comprehensive three-and-a-quarter-length success. Forever Together was a clear second, with another O’Brien runner Athena making late gains to beat Bye Bye Baby to third. The winning trainer’s wife and assistant, Maureen Haggas, said: “I’m thrilled to bits. I couldn’t be more pleased. “She’s a beautiful filly. William said he wanted to step her up in trip and she’s really enjoyed it. “She’s a beautiful, big filly and she’ll give the owners a beautiful mare when she goes to stud. Tudhope said: “I knew she’d stay this trip but whether or not she was good enough for this grade I wasn’t sure. “William liked her a lot and he doesn’t bring them here for nothing. I won on her at Ascot and knew her well. I knew she’s stay but didn’t think she was as good as that. “They’re not coming from behind here. We’ve held her up because she’s been keen but she’s learning and was better, more relaxed. O’Brien said of Forever Together: “She will appreciate going back up to a mile and a half and it was good to run her because she’s not a filly we’d be going to the Nassau (Goodwood) with. “She’s a filly that will probably even go further than a mile and a half. “The difference between her and Magic Wand (Ribblesdale Stakes winner) is that Magic Wand probably handles fast ground and is probably not mad about soft ground whereas this filly handles fast ground and like an ease too. The Pretty Polly Stakes is named after Pretty Polly, a successful filly foaled in Ireland in 1901. It was originally restricted to fillies aged three, but it was later opened to older horses. For a period it was classed at Group 2 level, and it was promoted to Group 1 status in 2004. 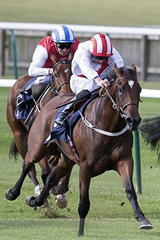 The Pretty Polly Stakes became part of the Breeders' Cup Challenge series in 2009. The winner now earns an automatic invitation to compete in the same year's Breeders' Cup Filly & Mare Turf. The race is currently held on the final day of the Curragh's three-day Dubai Duty Free Irish Derby Festival.